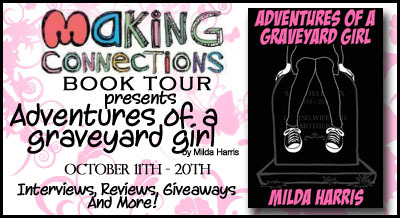 Welcome to my stop on the Adventures of a Graveyard Girl Blog Tour! There’s a guest post about the writing of this series, so don’t miss out! Kait Lenox is back! It’s Homecoming Dance time and Kait is excited. It’s her first dance with a date and that date is none other than one of the hottest, most popular guys in her school, Ethan Ripley! For once Kait doesn’t feel like a funeral crashing weird girl and it’s the most perfect romantic evening ever…at least until a girl gets murdered in the high school bathroom. Rumors fly, panic ensues, and Kait can’t help herself, she assigns herself to the case! I find that inspiration sometimes strikes in the most unusual places. My Funeral Crashing Series, in fact, was inspired by a conversation I had with my mother right after a funeral. Who knew I’d find inspiration during such a sad occasion? We started talking about professional mourners and my brain started thinking over the information. What if a sixteen year old girl did that? She’d be pretty weird, wouldn’t she? Then again, what if she was totally normal otherwise? I had to write about her! So, I wrote down the idea and put it away in my idea book. Time passed until one day, I decided to enter the 3 Day Novel Contest. It takes place every year over Labor Day Weekend. I looked through my idea book and found my notes on the Funeral Crashing Girl novel. That was the one I wanted to write, except I knew I’d need a lot more than that if I was going to rapidly write a whole book in three days. So, I did what a lot of other writers do…I procrastinated. The weekend was upon me before I knew it, of course. I had to write something. I had already paid for the contest and told everyone I was going to do it. So, I sat down to think about it. It was the night before. I knew I needed something really, really interesting to keep me and the story going. I had the funeral crashing. That was pretty interesting, but I needed something else. So, I decided Kait Lenox would also be an amateur sleuth. A murder mystery should be fun to write and if I got bored or stuck, I’d kill off a character! Of course, then I needed the killer and the motive and lots of tiny details to tie a bunch of clues together, so that the heroine could actually logistically solve the case. And, I wanted a love story. I love love stories. The contest started and I wrote and wrote and wrote. Three days later I had the gist of Kait’s story. I was pretty happy with it, actually, even though it was a really rough draft. That was very unusual. Of course, afterward I spent quite a bit of time fleshing out the story and figuring out more about the characters and developing them further. Then one day I found that I was finally done writing Adventures in Funeral Crashing. But…I didn’t want to be! 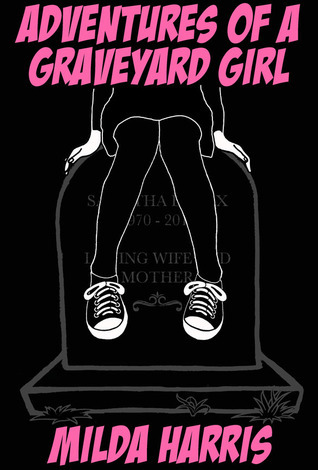 I had to write another Funeral Crashing book! I just had to! Kait’s story couldn’t be finished yet! It’s funny. Sometimes characters like Kait Lenox find you and just take over. She’s so much fun to write! And, I can’t help it! I’m rooting for her! Her story must be told – funeral crashing, mysteries, cute boys, and all! “I like the theme: A Night in Paris. Super romantic,” I said, trying to keep the conversation going. It was well done, actually. There was a big banner at the front of the gym, where the DJ was, announcing the theme for the night. A fake Eiffel Tower stood in the middle of the snack table, separating the snacks and the beverages. An Arc De Triumphe was the entranceway into the gym. The tables scattered around the dance floor were covered with white tablecloths and silver stars. The mood lighting was ultra romantic, with small fake candles sitting on the tables. “Yeah, it was all Madison’s idea. She’s our club president. Ariel said it was her idea, of course, but I heard Madison suggest it first,” Sarah said. I stopped myself from asking more about what Ariel had said. Was Sarah really criticizing Ariel? Was there dissension among the new group of bffs? I was dying to know, but there was no way Sarah was going to give me any juicy gossip if I asked her. The group lapsed into silence again. What were we going to talk about? “It looks very cool,” Ethan said, trying to get the conversation started again. The first notes of a romantic slow song were starting to play. I started swaying to the music. Couples formed all around us. We all watched them as we tried awkwardly to think of a conversation piece. “So, how about we dance?” Mike asked Sarah. “I’d love to,” Sarah said. “Bye guys,” Mike said, as Sarah dragged him away, totally grateful at the chance to get away from us. Then they walked away too, hand in hand. Ethan and I were finally alone. We stared at each other, suddenly awkward with one another. I felt a little nervous. We had been about to dance before, but suddenly the air was charged with possibilities. I nodded and took his hand. Ethan led me a little ways onto the dance floor and placed his hands on my hips, drawing me toward him. I hooked my arms around his neck. I caught the scent of his cologne. He smelled amazing. We started moving to the notes together, side to side. My stomach was doing nervous excited flips. Now this was the best moment of my life. Ethan looked down at me and I looked up at him, our eyes meeting. I leaned up to kiss him. I really couldn’t have asked for a more romantic Homecoming Dance moment. It was so perfect, but just as our lips were about to touch, we both jumped as the music stopped with a screech, ending in dead silence. Then I heard the girl screaming, and screaming, and screaming. Love the title and retro cover. Have to put this series on my TBR list on Goodreads now.